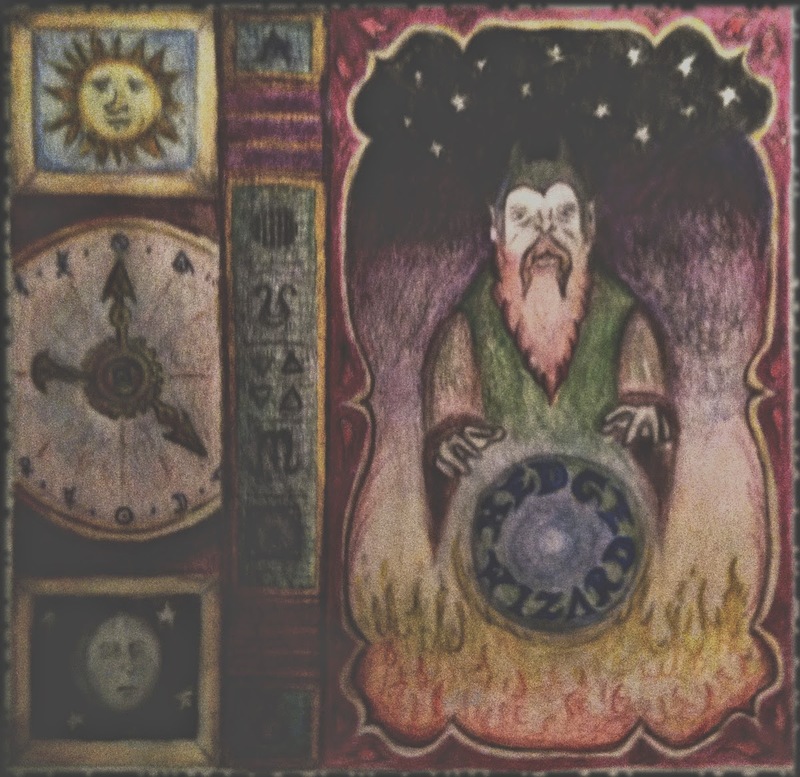 A solitary magician toils away, struggling to uncover the arcane secrets hidden within ancient tomes, alchemical substances, and strange divinatory artifacts. Removed from the world, he whittles away his time, often in vain, for those few brief glimpses through the veil normality. He knows of the haunted statues deep in the tower's catacombs, which spring to life when the torches stop burning. He has seen through the sphere of crystal, that lost shore of the fabled god lands, said to hold those final glimmering cities. He has spoken with the beings that watch and weigh the affairs of mortals eternally, invisible and silent to all but those unlucky few who manage to slip through the cracks of our dimension. He is not immortal... yet, though he wields strange powers that will astonish and bewilder, and some incomprehensible even to himself. The first striking thing about this album is the incredible cover art. It is perfect for the sound, pure magic. It's like a mix of illuminated manuscripts, 70's van art, and mental asylum art therapy. It has a primitive mystical ugliness that matches the sound of the music exactly. There seems to be a significant Burzum influence here, particularly noticeable with the track Odd Visions, which would not sound out of place on Dauði Baldrs. Fortunately, Hedge Wizard is not nearly as repetitive, and seems to always switch the melody or add another layer before a tune ever begins to overstay its welcome. It also sounds like there are some nods to video game music here, such as Cemetary Violence, which almost sounds like it could be a Castlevania track. In the sense of the spirit conjured, I also find this album somewhat reminiscent of the Isengard track, "The Halls and Chambers of Stardust the Crystallic Heavens Open," in that it somehow manages to hold some subtle otherworldly feeling far beyond what the simple melodies suggest on the surface. The tightness and level of detail in the composition leads me to believe the lo-fi aesthetic is fully intentional. There is no wasted space here. Every wrinkle contributes to the complete vision. The recording quality is pretty bad, but not in a way that anything is lost; it only adds to the obscure and archaic atmosphere. There is so much originality in this album, but it is still true dungeon synth in the most saturated form possible. Even though the general sound is familiar, the loving textural exploration of these synths displays fresh sonic discoveries. They groan heavily with low bassoon/oboe tones, often sounding far more like toys than professional equipment. There is little noticeable reverb, especially relative to most of the genre, and that allows the primitive sound of the synths to shine through to very good effect, especially the shrill, shimmering pads. Strangely enough, the raw production creates a sort of distance, without needing the help of reverb. It makes me pictures drifting clouds of pixel fog surrounding and obscuring the work desk of a feared alchemist. Only a legendary potion-maker could distill dungeon synth so purely. Great to see another post. Really enjoy this blog. Great to have you back, I love this blog! Good to see you return to the fray. I actually bought 'More True Than Time Thought' when it was released and am quite fond of it. Glad to see you back Andrew : great news ! Great review and, even better, you're back.